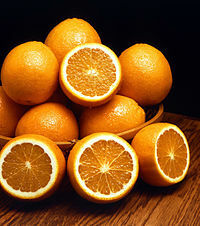 An orange is a type of citrus fruit that people often eat or they can sniff the skin when grinded into a smooth powder. Oranges are a very good source of vitamin . Orange juice is an important part of many people's breakfast. The "sweet orange", which is the kind that are most often eaten today, grew first in South and East Asia but now grows in lots of parts of the world. Oranges are round orange-coloured fruit that grow on a tree which can reach 10 metres (33 ft) high. Orange trees have dark green shiny leaves and small white flowers with five petals. The flowers smell very sweet which attracts many bees. Oranges are an important food source in many parts of the world for several reasons. They are a commonly available source of vitamin C. They last longer than many other fruits when they are stored. They are easy to transport because each orange comes in its own tough skin which acts as a container. They can be piled into heaps or carried in bags, lunchboxes and shipping containers without being easily damaged. The colour orange takes its name from the fruit. The word "orange" is unusual because it is one of only a few English words that do not rhyme with anything. Sweet orange trees were brought to Italy, Spain and Portugal from India in the fifteenth century (1400's). Before that time only sour oranges were grown in Italy. The name is from a Sanskrit word, via Persian and Arabic. From Europe, orange trees were taken to the United States, South America, Africa and Australia, which all grow oranges for sale. One type of sweet orange is called the "blood orange" or "sanguine orange" (sanguine means blood red). These oranges often have red marks on the skin, and some parts of the inside look as if they have blood in them. Some blood oranges make juice that is ruby red. These oranges are called "Ambersweets"
In the 1850's, in Brazil, a tree growing in a monastery garden was making very odd fruit. Inside each orange skin there was a large orange with no seeds. At the bottom of the orange was a baby orange, which was really the bigger orange's twin. The little orange made a strange bump at the bottom of the orange skin, that looked just like a human navel or belly button". These oranges were named "Navel Oranges". They tasted very sweet, they had no seeds and they peeled quite easily. This made them a very good orange to grow commercially. But they could not grow from seed. They could only grow from plant cuttings. Nowadays, thousands of these orange trees have been planted from cuttings. "Navel Oranges" are grown in California and exported to many countries of the world. Every navel orange in the world has the same genetic make up as the oranges on that tree in the monastery in Brazil. Mandarins, small flattened oranges with skins that come off easily, are believed to have come from China. Now there are several varieties. These include tangerines, which are redder than most mandarins, and clementines, which are large, smooth and plump. Mandarins of all sorts are very useful lunchbox fruit, because they are easy to peel and eat, but do not get squashed easily. Nowadays, many people of the world eat an orange or drink orange juice every day, because oranges are one of the best and cheapest sources of Vitamin C. Human bodies, unlike many other animals, do not manufacture Vitamin C, so a human needs vitamin C in their diet regularly. (Vitamin C helps the body to grow, to heal wounds and fight infection.) Oranges are also a very good source of dietary fibre. But they do not contain high amounts of minerals. If a person eats an orange and a banana together, then they have had a very nourishing snack that supplies both vitamins and minerals. Oranges are sweet and juicy. Orange trees are a symbol of love and marriage in many cultures. Oranges are sometimes found in Renaissance paintings of married couples. One of the most famous is Jan van Eyck's "Wedding Portrait of the Arnolfini". Brides traditionally wear orange blossoms in their hair or carry them in their bouquet at their wedding. Orange blossoms are often part of the decoration on a wedding cake. Queen Victoria was given a coronet of gold and enamel orange blossoms by her husband Albert. When their children were born, he had a jeweller add tiny green oranges to the coronet. If an orange is peeled with a knife, it is possible to cut the peel off in one long unbroken piece. Schoolgirls in some countries chant a rhyme, and throw the long orange peel over their shoulder, then look at how it falls to find the initial letter of the name of the boy that loves them. In some countries, blood oranges are seen as a symbol of the death of Jesus. In some European countries, a "Christingle" is a Christmas decoration using an orange and a candle to symbolise Jesus' love for the world. In cold countries, when fruit was scarce, an orange was often given at Christmas. In England, it was traditional to stuff the toe of a child's Christmas stocking with raisins, almonds and oranges. Orange peel can be dried and treated with sugar. It is an ingredient in Christmas cakes. Oranges are sometimes used to make a sweet-smelling pomander to perfume a room. This is done by sticking the stalks of cloves into an orange, and allowing the orange to dry out. Orange jam is called marmalade. Traditionally, it is said to have been first made for Mary Queen of Scots or Marie Antoinette when they were sick. Neither of these stories is true, as marmalade was made in Portugal for many years before either of them was born. The term "marmalade", originally meaning a quince jam ("marmelada" in Portuguese), derives from the Portuguese word for this fruit, marmelo. An English children's song about the church bells of London begins with the line "'Oranges and Lemons' say the Bells of St. Clements..."
This marmalade is made from Seville oranges. ↑ 3.0 3.1 "Who Put The Navel In Navel Oranges? : NPR". npr.org. Retrieved 2009-04-23. This page was last changed on 4 March 2019, at 15:34.